Night Guards and Aligners. The most common applications of 3D printing in dentistry are transparent aligners and night guards. Aligners, which serve as alternatives to braces, have become especially popular because of their invisibility. Crowns. Dental 3D printing has made creating crowns incredibly simple. The doctor scans the broken tooth and then uses software to create the model of the crown. They can create it in their office in less than 30 minutes using either a special resin or CNC technology to carve the crown out of porcelain. Surgical Guides. Oral surgeries need to be very precise, and dental 3D printing has made precision easy. A 3D printed guide designed to fit perfectly in a patient’s mouth is an indispensable asset for a dentist. Models. In dentistry, it’s very important to get things right the first time, and dental 3D printers ensure this. Doctors can print a model of the patient’s mouth, and verify that their implant, crown, or aligner will fit with precision. 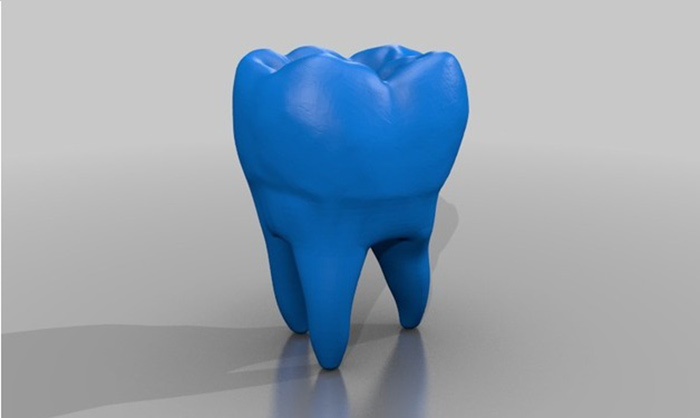 While dental 3D printing has already been established as a successful industry, development continues to move forward. New applications are constantly emerging, each hoping to fill a different niche of the industry. A very promising project from the University of Groningen in the Netherlands is working to create a printable material that would kill bacteria on contact. This would have a huge impact on the dental industry, as aligners, crowns, and implants would be that much more resilient and long-lasting. This entry was posted on Sunday, December 16th, 2018 at 8:47 am	and is filed under 3D, printing, technology. "AI Recreates Paintings With 3D Printer [VIDEO]"
"3D Printing Conquers Aerospace Industry"